Ask fellow campers about "La Hacienda RV Resort & Cottages" and nearby attractions. Although this is an Expensive campground, it checked all our boxes. Nice space although our site was not quite level. Great location, easy access to shopping. Full hookups, good water and electric. It was FREEZING while we were here so we did not get to use the pool area; fitness room and shower rooms are nice. Two dogs parks with ample trash/baggie receptacles. We would stay here again! We camped at La Hacienda RV Resort & Cottages in a Motorhome. First time to stay at this Sun Resorts Property, La Hacienda RV Resort. Found navigating around the park roads somewhat difficult and had to change designated pads due to the size of our rig, but once that was settled the pull thru site were given was fine. If you have a large rig and are making a reservation online, you may want to the facility and discuss your needs. We camped at La Hacienda RV Resort & Cottages in a Motorhome. If you have a large Class A coach, be sure when making a reservation to emphasize your size and that you want a space that is clear of the tight roads and trees. This is not an easy park to navigate in with a larger size Class A coach. Thank you richardwil678 for leaving us a review about your stay at La Hacienda RV Resort. We appreciate your feedback and hope that you will stay with us again on a future visit to the Austin area. We stayed for five weeks and thoroughly enjoyed our stay. We were in Section B and had long and wide tree shaded spot. The park is large and well layed out with many amenities. Office staff and grounds folks were top notch and very helpful. Only two issues, the WiFi while good will drop and have to be reselected upon each use and the big one was a big lack of usable dog run/Park. At one time they had very large area complete with dog wash. This area is now padlocked as it is over a septic drain field that needs repair. The many, many dogs are left with 2 small areas that are disgusting due to the pee and poop from so many dogs in such a small area. This needs attention. Location is close to Lake Travis but traffic on Hiway 620 which is the east/west road towards the park is very congested. Will certainly be back and recommend to fellow RV folks. We camped at La Hacienda RV Resort & Cottages in a Motorhome. Lots of great restaurants nearby with an H-E-B super store with its own bar and restaurant close by, and it is fabulous. Thank you tomcotten for leaving us feedback about your stay at La Hacienda RV Resort. We will definitely pass along your feedback to the resort maintenance team. We want to make sure all guests - even our furry ones have a great stay. The rate was based on a monthly rate. This is a nice RV park, our site was great; level and large because it was on the end so we had a grassy area with no neighbor on one side. Most sites are fairly close together, some trees, lots of grass and gravel. Verizon cell service was fine. Didn't use campground wi-fi. Roads are easy enough to maneuver in our 45' motorhome. We were able to get satellite service on our site. People are nice and friendly. Good location for visiting Austin although traffic on 620 can get really bad at times. It's just the way Austin is. The negative: There are many long term residents and they set up lots and lots of "stuff" on their sites which can be very unattractive. Seems like the campground does not monitor what is allowed and it is starting to look congested and sloppy. We have been coming to this RV Park for many years and it has been getting worse in that regard. I still like staying here but feel that the management should take set some boundaries regarding what is allowed on sites. We camped at La Hacienda RV Resort & Cottages in a Motorhome. Thank you SNL for leaving us a review about your stay at La Hacienda. We appreciate your feedback and will pass along this feedback to the on-site management team. 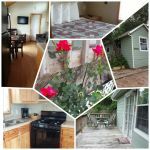 We hope that you will come and stay with us again on your next trip to the Austin area. Simply the most modern, prettiest RV camping in the Austin area, and priced accordingly. Staff is professional and friendly enough. Sites are immaculate gravel bordered by concrete with concrete patios, and are mostly level side-to-side, though some slope fore-aft. The pool and spa are beautifully maintained. WiFi is among the best I've experienced, with lots of access points so the signal is strong almost everywhere, and well able to handle all the connections, though at night it slows down as usage skyrockets. I'm in Austin several times a year on business, and this has become my go-to park. It's about 20 miles to the University area, which takes anywhere from 30 to 60 minutes. There are places more convenient to downtown, the race track, and the rodeo for events, but for business travel this one works. 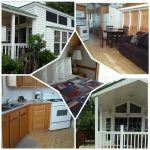 We camped at La Hacienda RV Resort & Cottages in a Travel Trailer. Thank you telecommuting camper for leaving us a review about your stays at La Hacienda. We are glad that you have enjoyed your many visits and appreciate your business. We look forward to seeing you again on your next business trip! We spent four nights at La Hacienda and really enjoyed our stay. Park is beautiful and well cared for. Staff was very helpful and eager to please. We will return here again and would recommend to anyone looking to visit beautiful Austin TX. We camped at La Hacienda RV Resort & Cottages in a Motorhome. We have stayed here for six winter seasons This park in the last two years has deteriorated from a five star campground to maybe two stars at best. the lawn is not mowed regularly. The staff is not required to maintain their site. C24 is the worst in the park. When a resident complained about this site, she was personally attacked by the manager. The rates have been raised regularly but with no improvement in amenities or services. The heat failed at the pool and was not repaired for weeks. They were simply shut it down. The staff is poorly trained. If we did not have many friends here, we would be long gone. 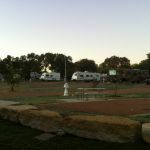 We camped at La Hacienda RV Resort & Cottages in a Motorhome. We've stayed here 4 or 5 times since 2012 and the park and gone drastically downhill. It was a high end RV resort and has turned into an average trailer park with more full time residents. The last 3 times we've stayed here the police showed up to arrest somebody so I keep my basement doors locked and anything other than deck chairs stored away. Lots of the sites are junked up because the people have been here for years. There is a motorhome in one site that hasn't been used or moved for 5 years and is falling apart. The streets get crowded because most of the residents have more than one vehicle along with utility trailers. The pool is closed, a dog park is closed, and one of the toilets in the shower facility has been broken for two weeks. When we moved into our site it was littered and fireplace ashes were spread all over. We camped at La Hacienda RV Resort & Cottages in a Motorhome. The Mexican restaurant down the road is pretty good. 620 gets busy so avoid rush hours. Fredericksberg is worth the drive, along with a stop at the LBJ Ranch. Nice enough staff but did not know ther own park amenities...said there was a dog park but didn't know it was padlocked and split so you could go to other half of park...pool closed and hot tub not working(main reason we chose this resort...no cable without extra box per tv...all gravel sites...no water in pond the thought was a great view...very overloaded with permanent residents...glorified trailer park. We camped at La Hacienda RV Resort & Cottages in a Motorhome. Austin downtown is 30 minutes away...close by do not miss views at upscale Steiner Ranch Steakhouse or Oasis or Lucy's. We were very disappointed in this park. From the website and reviews here, I was expecting much more. It seems fine for smaller rigs but is not exactly big rig friendly. Many bigger rigs (40+ feet) you'll find rigs parked with wheels off the ground, including ours. The more level sites seem to be in the B section which is mostly long-termers. The alternate site we were given was more unlevel than the original so we opted to stay in the original site (which was unlevel everywhere). We tried 8 different spots within the pad without any luck in leveling. The office said they'd never had a problem with our space when I challenged "Has anyone been over 40 feet?" They conceded that they mostly have smaller rigs. They also conceded that they know some rigs that are larger have wheels off the ground. The roads are extremely tight. We were stuck getting to our site because someone parked on the road (luckily they came out after 2 minutes to move their car). Turns can be done but only if you are going 1 mile per hour. There are parking locations throughout the park making pulling out of our pull through space VERY tight. Two sewer hookups available. One is located on the pad itself so be careful driving. Internet is decent enough. The only true positives about this place is the front office staff, who are really attentive, and the dog park. The dog park is by far the biggest we've ever seen. It appears to be a baseball field converted into two dog parks, joined together by a gate but separate (great for dogs who don't like other dogs in their immediate space). It is maintained decently and lots of fun for your canine family members. We camped at La Hacienda RV Resort & Cottages in a Motorhome. Nicest resort in Austin. But call way in advance to make reservations as the park looks to be 85%+ full or long time residents- many 5th wheels. Not all gravel sites are level. Manicured grass and spotless park- staff are on site every day working to make it a very nice place to stay. Some resident sites a bit over stocked with personal belongings and many extra cars parked on sites. I asked for end site c-55- more spacious site . Wifi strong. No cable without one of the parks conversion boxes, but our Winnguard Razor roof top antenna picked up many local channels, we also had our sat. Watch the turn corners- for a big rig with tow will be tight and large boulders on grass near street to prevent you from cutting corner and getting on grass. Not assisted to site- so send the towed car to scout the route. We camped at La Hacienda RV Resort & Cottages in a Motorhome. This is a nice dignified park so why would they allow a vendor to use his gasoline engine power washer to wash coaches on Sunday? Makes no sense to me but certainly violates the peace and dignity of the place. Just asking, aren't 6 days enough Ms Manager? I hope this guy is a line item on your income statement and you're using the revenue to keep the rates down. Yes? We camped at La Hacienda RV Resort & Cottages in a Motorhome. A little pricey but nice park. I stayed here to visit a friend. We camped at La Hacienda RV Resort & Cottages in a Fifth Wheel. We'd be inclined to rate this park based on our specific site but that would not be fair. More on the site later. Check-in was smooth and we were warmly greeted by the staff who were very helpful and informative about the Austin area. The campground is located in a more gently sloping portion of the hills and has a small "older" section to the west with only gravel pad/patio and little grass and lots of trees. The majority of sites to the east are beautifully planned, level, with plenty of length and width on concrete pad/patio and with fewer trees so more open to the sky. Cable TV is supplied using a converter box and functioned very well. Over-the-air reception picked up 50 channels. Wi-fi performance was good. 50a power was stable, water pressure was around 50psi. Dump port was conveniently located. The utility hook-up pedestal is located about 5' behind the RV. When we booked, only site A6 was available. This is likely the least desirable site in the park. It's an up-hill sloped, back-in on gravel with a dirt patio area, tree covered and no grass. Even with auto-leveling, bring blocking. Backing a 39' rig into the site was do-able with some jockeying. There is a huge electric panel and transformer about 10' to the rear, a park model located 5' from the off-door slide, a fire hydrant prominently stood 10' off the middle of the door side and the picnic table covered a 15" square block of concrete standing 6" high with an access port to the water line. Thee picnic table was a foldable plastic model that couldn't be used because your arms / legs broken edges all around. A staff member upon seeing it said she would get it replaced. We requested again at the office several days later. Never happened. Considering A6 is priced the same as sites in the A section, it was ok for a desperate short term stay but we wouldn't choose it again. We would come back to La Hacienda for any other site in the park. 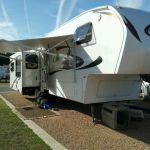 We camped at La Hacienda RV Resort & Cottages in a Fifth Wheel. 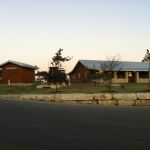 Because the South by Southwest and Rodeo Festivals and Spring Break occurs in Austin during middle March, RV sites around the area were difficult to find in most every park without advance reservations. Just down the road from the resort are several go-to spots - the Saigon Cafe serves great Vietnamese/Thai food, Los Pinos for Mexican fare and the Infamous Brewing Company for fresh beers. Rate shown reflects monthly rate of $660 + electric. Books up very fast for winter months - taking reservations 2 years in advance. The only reason I did not give 5 stars for cleanliness is the dog park. There are persistent muddy areas that stink - I've been told that this is because the dog park was built over the former septic field. There is a free dog wash station. Everything else about this park is first-rate. On the plus side, the dog park is very large and grassy and my dog loved it. Park is big rig friendly. Laundry is $2 wash, $2 dry. Lots of planned social activities, friendly patrons and staff. Pool and hot tub are wonderful. This park also has a container for recycling - rare and appreciated! 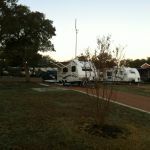 We camped at La Hacienda RV Resort & Cottages in a Fifth Wheel. Half hour minimum to get to downtown; local area is upscale with plenty of dining and shopping options. There are plenty of year-round residents who can give tips. Provide your email address to get notifications of on-site events: poker, bunco, Saturday breakfast, live entertainment, etc. Be prepared for the traffic and construction in and around Austin at all times. It's manageable if you choose your driving routes and times of days carefully. If you are 62 or over take advantage of the free senior pass that gets you into all the LCRA parks on the highland lakes. Visit The Oasis on nearby Comanche Trail. It is an entertainment and dining complex on the cliffs overlooking Lake Travis. Spectacular view and awesome sunset view! 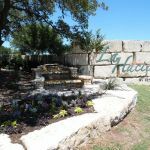 Located at Lake Travis near Lakeway with lots of shopping, restaurants, etc. About 30 miles to downtown Austin via good roads, but LOTS of cars and residential traffic. Easy drive to UT where Lyndon Johnson Presidential Library is located. Check for road construction. Austin is a big city, take your pick. We spent a few hours at Balcones Canyon NWR and enjoyed that. Traffic along RR620 can be very busy (especially during Austin's rush hours). The park is located a few miles away from shopping areas. The little mexican restaurant down the road, Los Pinos, is awesome and has $1 breakfast tacos to go. If you are there in early April, check out Turkey Bend, on the other side of the river, to see the most amazing Bluebonnet fields. The city of Austin, Winery/Hill Country, Lake Travis, biking around Lady Bird Lake, The Capital, and Congress St and all its great restaurants. For walking dogs at night, take a flashlight. There is limited illumination. Eat BBQ at Rudy's on 620. Also delicious tacos at Torchy's also on 620. If you visit between April and November go see the flight of the bats at the Congress Ave. bridge at dusk. Eat at Franklin BBQ worth the wait. Drive to other areas in Hill Country. Got to go to Hopdaddy burgers when in town on S. Congress St. Line can be awful long, but it's worth the wait. We chose a weekday and arrived around 11 and were able to have our order placed within 30 minutes. Go at popular times and you'll wait at least an hour. Outside seating available for pooch. Are you affiliated with La Hacienda RV Resort & Cottages ?